Which New Mexico Schools are Best for Medical Assisting? In New Mexico, medical assistants are expected to be in high demand from 2012 to 2022, with an average of 200 additional positions available during that time. Medical assistants who want to stand out from the crowd can enhance their skills, knowledge and resume with an accredited training program, as well as nationally-recognized certification. Whether a student hopes to focus their time in the front office or work with patients in the back office, a medical assisting school in New Mexico is where it begins. Read on to learn more about New Mexico medical assisting schools, as well as information on salary and job growth for graduates. Earning a degree or certificate in medical assisting is the first step to a career helping to care for others in a bustling health care clinic or office. A medical assistant works with patients, checking vital signs, administering medications and scheduling appointments and they take care of some of the general medical office work. To find the right program that offers all the services and specialties you’re interested in, first do your research. 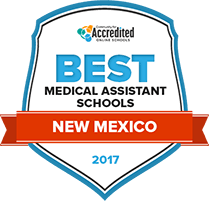 We have a head start for you with our list of the 2017 Top Schools for Medical Assisting in New Mexico. While pursuing studies that lead to the medical assisting certificate and the medical assisting associate's degree at Eastern New Mexico University's Roswell campus, students learn that the medical assistant role involves more than managing patient records and processing billing. Material that is taught during classes like anatomy, physiology, laboratory procedures and clinical procedures, demonstrates that medical assistants perform work that takes place outside an office. Length of the certificate program is three semesters or 41.5 credits. It takes another 27 credits or two additional semesters to earn the associate's degree. Santa Fe Community College's School of Sciences, Health, Engineering and Math awards an Associate in Applied Science in Medical Assisting and a medical assisting certificate. Applications are available online. Completed applications are submitted to the medical assistant director program. Careers that align with the one year certificate and the two year associate's degree programs include medical assistant, laboratory assistant, medical billing clerk, medical coder and phlebotomist. Types of classes in the program that first launched in 2007 include developmental psychology, basic life support for healthcare, anatomy, medical assistant laboratory and medical office insurance and finance. New Mexico offers several medical assisting schools that suit the needs of those who want to work in the state. In most cases, those who graduate will be ready to obtain certification. This search tool can help aspiring students wade through the many programs in medical assisting to find the one that is the right fit. How does New Mexico define "medical assistant"? New Mexico does not have a specific definition for medical assistant in the state statutes. However, the laws in New Mexico do mention the potential scope of practice of unlicensed personnel, which would include medical assistants. Medical assistants in New Mexico can perform tasks that are delegated by a physician, but cannot hold themselves out as physicians, nor can they perform tasks for which a license is required, such as prescribing drugs or administering sedation. Is certification required for medical assistants? New Mexico does not have any set requirements for medical assistants, therefore there is no certification requirement in the state. However, an increasing number of employers require certification of applicants. Due to the increased clout a certification can lend a resume, some students choose to earn certification after attending a training program. Certification is available to those who have completed a formal education program. The following certifications are recognized in most states, including New Mexico. Formal education is not required to work as a medical assistant in New Mexico. However, those who want to obtain certification must graduate from an approved medical assisting program. Are there tasks outside the scope of medical assistants in New Mexico? Understanding what salary to expect after graduation is an important part of making informed career decisions. The chart below focuses on annual wages in the nation as well as those in New Mexico. Remember that the median wages for the state might translate into lower or higher numbers, depending upon the geographical area. The following chart focuses on the various salaries that can be expected throughout the state. New Mexico medical assistants can expect to see impressive job growth from 2012 to 2022, according to Projections Central. The state expects to add an average of 200 medical assistants during that time period. The following chart breaks it down further. For a brief look into what kind of medical assisting schools are available in New Mexico, check out this spotlight school. Upon completion of either medical assisting program, students will be able to process laboratory testing, measure patients' vital signs, understand various healthcare law and perform basic medical office administrative functions. Students have the option of earning a medical assisting certificate in three semesters or an associate in applied science medical assisting degree in about two years. New Mexico's statute regarding the practice of medicine in New Mexico contains provisions that allow medical assistants to perform tasks under the supervision of physicians. The New Mexico Society of Medical Assistants brings together medical assistants from around New Mexico to help provide professional advancement, improved care and educational opportunities to maintain the Certified Medical Assistant certification.